Playing With Fire shares the "let's do it now" sample with METALLIC MIND, from beatmania IIDX 14 GOLD. Playing With Fire shares some vocal samples with Juggler's Maddness. 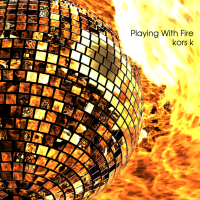 A long version of Playing With Fire, titled Playing With Fire (Extended), can be found on kors k's Let's Do It Now!! album. A remix of Playing With Fire by Sota Fujimori, titled Playing With Fire (Sota Fujimori Remix), can be found on the "Let's Do It Now!!" Special Remix CD, the CD given by pre-ordering Let's Do It Now!! at the KONAMISTYLE shop. A short version of Playing With Fire (Sota Fujimori Remix) can be found in REFLEC BEAT groovin'!!. A sequel to Playing With Fire, titled I'm On Fire, appears on kors k's Let's Do It Again!! album. A short version of I'm On Fire can be found in REFLEC BEAT groovin'!! Upper. Playing With Fire is one of the unlockable songs of the first Phase of REFLEC BEAT colette -Spring-'s Pastel Adventure colette Garden unlocking system. To obtain it, you must have bloomed any two different seeds of the Cherry-shaped Seed (桜形のたね), the Pointed Seed (とがったたね) or the Fairy Seed (妖精のたね). From REFLEC BEAT groovin'!! to REFLEC BEAT VOLZZA 2, Playing With Fire was playable by default. Playing With Fire is a song part of the POLICY BREAK event. For more information on the dates it can be unlocked in the SOUND VOLTEX series, please see the event page. Playing With Fire was used as the main background music during the KONAMI Arcade Championship 2013 broadcasting. After being removed from the initial release of REFLEC BEAT 悠久のリフレシア, Playing With Fire was revived on March 1st, 2018. Playing With Fire is one of the Second Library unlocks of beatmania IIDX 26 Rootage's The Bibliotheca of Mirage (蜃気楼の図書館) event. It can be unlocked from January 28th, 2019.
beatmania IIDX difficulty rated from 1 to 12. This page was last edited on 31 January 2019, at 14:18.